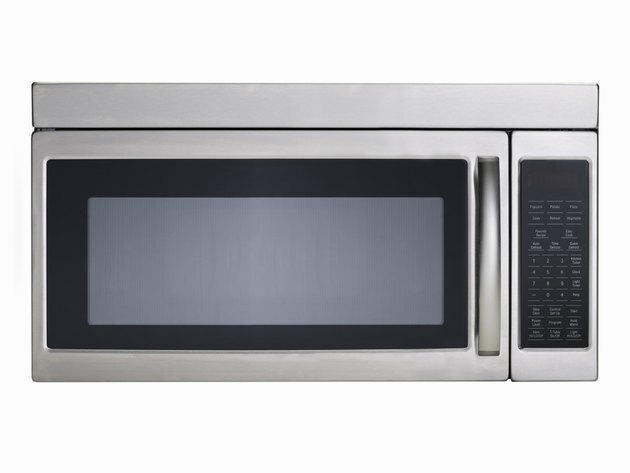 The sleek look of stainless steel microwaves and convection ovens gives a kitchen a modern look, until dirt, food residue and fingerprints mar the pristine surface. Stainless steel comes in a matte or gloss finish. Improper cleaning can cause unsightly scratches on both types of finish. The durable metal resists stains and corrosion, so most dirt is only surface deep and wipes off easily when cleaned correctly. Polishing the microwave and convection oven after cleaning brings back the luster so the stainless steel looks new again. Weekly cleaning keeps small stainless steel appliances sparkling. Wipe down the stainless steel exterior with a damp rag to remove surface soil. Use only nonabrasive rags when cleaning stainless steel. Dip a clean rag into pure white vinegar. Scrub the oven with the vinegar until the dirt is completely removed. Alternatively, use a commercial stainless steel cleaner. Lay the vinegar- or cleaner-soaked rag over any stubborn dirt that won't wipe off. Leave the rag in place to soak for five to 10 minutes to loosen the dirt, then wipe clean. Rinse out the rag with clear water. Wipe the oven down again to remove the cleaner residue. Wipe dry. Dampen one corner of a clean, dry rag with olive oil. Rub the oil onto the stainless steel surface to remove any remaining streaks and bring out the shine of the metal.